It's the Rheo Thing: Recycling Paper Around the World - Literally! On Friday, one of our colleagues gave a "Brown Bag Seminar" (i.e., he talked at noon while the rest of us at lunch - a very informal setting as you can imagine) on recycling markets, something he was pretty familiar with from prior experience. I'm not going to go into a lot of the details, but one slide really caught our eye. It was a picture of Ms. Zhang Yin and and the question "Who is this women and what does she have in common with Oprah and J.K. Rowlings?" The snide response was that she was filthy rich, and it turned out to be totally correct. In fact, she is richer than Oprah and Ms. Rowlings, and is regarded as the richest-self made woman in the world. 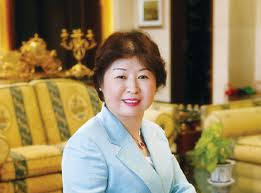 She is the largest shareholder of Nine Dragons Paper Holding Company, a company that - in part - imports paper waste from the US and then makes cardboard with it for shipping products back to the US. We were all taken aback by the expense of shipping paper waste across the ocean, but then realized that it probably makes sense. The boats are empty from what the US imports and doesn't export, so putting pretty much anything in the empty containers is economical. It adds a second layer to the meaning of "recycling" as the paper cycles the globe.